Wisconsin Dog Bite Statute of Limitations | Hupy and Abraham, S.C.
How long do I have to file a dog bite injury case in Wisconsin? Time is limited for you to file a lawsuit for your dog bite injury. If you fail to file your case by this deadline, then the defense will make a motion for the court to dismiss your case, the court will grant that motion, and you will be unable to recover damages. Thus, you need to know when your time to file a case—or statute of limitations—expires. 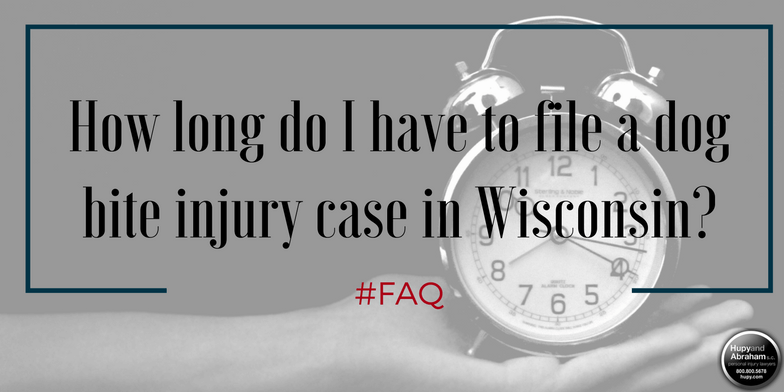 Generally, the Wisconsin statute of limitations for dog bite injuries is three years from the date of the dog bite. That means that in most cases you have three years from the date on which you were bitten to formally file a legal lawsuit, but it does not mean that you should wait three years to contact an attorney or pursue your legal claim. It also does not mean that there aren’t exceptions to the general rule. The most important exception to the three-year statute of limitations for Wisconsin dog bite injuries is for children. Children who suffer dog bites when they are under the age of 18 have an extended statute of limitations. In most cases, the statute of limitations is extended for two years after their 18th birthday. While the statute of limitations allows you a generous amount of time to file your claim, that does not mean that you should wait. By contacting an attorney as soon as possible, you not only make sure that you act before the statute of limitations expires, but you may also be in a better position to preserve evidence and you may be able to recover damages sooner. Parents of minors who have been hurt, and those adults who have themselves been injured, should contact an experienced dog bite lawyer as soon as possible after a dog bite injury. For more information about how Wisconsin dog bite cases work generally and about your own recovery specifically, please call us any time—24/7—at 1-800-800-5678.